3 Bedrooms / 3 Baths / Formals / Playroom / Breakfast Area / WBFP / Wet Bar / Balcony / 2-Car / Corner Lot / 2,578 sq. ft. Situated in prestigious University Park within the award winning Armstrong School District, this wonderful traditional townhome is nestled on a corner lot overlooking scenic views of Dallas Country Club’s golf course and has fabulous drive-up appeal. Details include soaring ceilings, an open floor plan with spacious entertaining rooms, hardwood floors, elegant crown molding and recessed lighting throughout. The fabulous two-story townhome offers approximately 2,578 square feet, three bedrooms, three baths, two living areas, two dining areas, a fireplace, wet bar, balcony and a two-car garage. Through the wood-and-paneled door, the front foyer, with slate floors, opens to a dramatic two-story living room, which is centered by a wood-burning fireplace, with a wood carved mantle and a marble surround. Light-filled windows with plantation shutters yield natural light on the hardwoods and also overlook fabulous views of the Dallas Country Club golf course. Conveniently serving the area is a wet bar with a bar sink and abundant storage. Providing great entertaining flow, the living room steps up to a hallway, which leads to the formal dining room, kitchen and a guest bedroom with a full bath. Capped by a pop-up ceiling and graced by an iron chandelier, the spacious dining room also features an open half wall of elegant wood carved balusters and overlooks the two-story living room. The dining room also flows to an expansive remodeled island kitchen, which showcases granite counters, stainless steel appliances, a desk area, and a breakfast area opening to an iron-grilled balcony. A utility closet also provides room for a full-size washer and dryer. Perfect for relaxation, the generous-sized guest bedroom is crowned by a beamed ceiling and is also accented with hardwood floors, window coverings, a large walk-in closet and an adjacent elegant full bath. The bedroom may also be used as a den. Second level of living is equally impressive. The luxurious master suite is oversized and boasts a sitting area with windows providing an abundance of light, neutral carpeting and a gorgeous limestone bath with his and her sinks, a vanity desk, soaking tub, separate double shower, two skylights, and a huge walk-in closet. Down the hall, a third bedroom is spacious and also includes hardwood floors, a large closet, full bath and an adjacent sunroom with ceramic tile floors and light-filled windows. Additionally, stairs lead from the second floor down to the basement level and reveals an attached two-car garage with extra room for storage and a work shop area complete with built-ins. 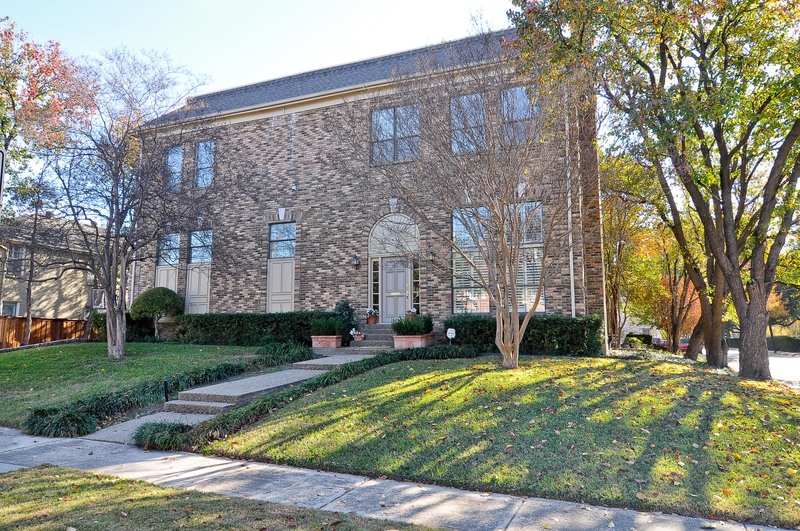 This is a fabulous opportunity for a wonderful townhome in the Armstrong School District with scenic views of Dallas Country Club!